if you follow me on Instagram! I had to share them! amongst some grey Melbourne days. There are a lot of similarities between the sets! make our last round of blocks! All will be revealed in September! Your blocks are fantastic, I definitely love this months' colors!!! So fresh! And the choice for May looks great too! 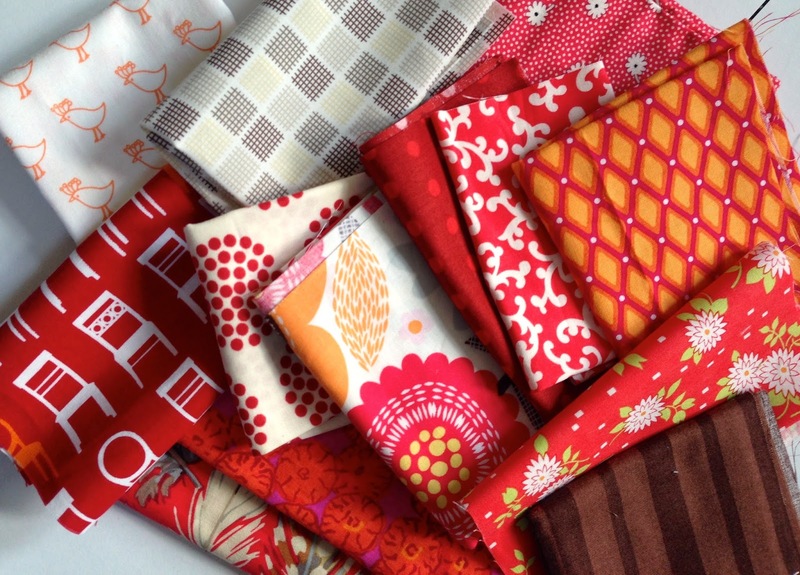 I love the colours and fabrics you've used this month. I can't believe the swap is nearly finished. This was such a great idea for a swap... any plans for another one after this one is finished? They are so beautiful! I can't wait to see the finished quilts, they will be a glorious riot of colour! Fantastic! I can't wait to see the quilt top! Very Springy indeed! And I love the last photo's fabric - the colours are so vibrant. Such a great color story in these blocks! Ohh I'm loving all that fabulous colour!! You must be so excited about how this project is coming together, it's going to be a gorgeous quilt!! The colors are charming, Susan. They have an Easter-eggish feeling to them. 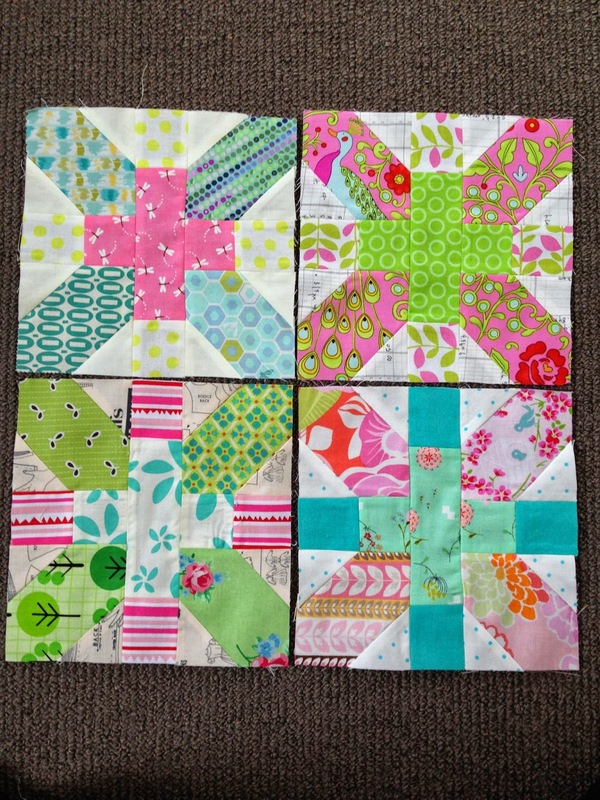 I have to admit to liking the pink, even though I rarely use it in my quilting adventures. Hope you're hanging in there with your busy school schedule. Oh my gosh! I think these may be my favorite! So bright and fun. Maria and I started a month later so we have some catching up to do. I cannot wait to see everyone's quilts! These are gorgeous blocks. Love the colours! Weeee! to the May color scheme! 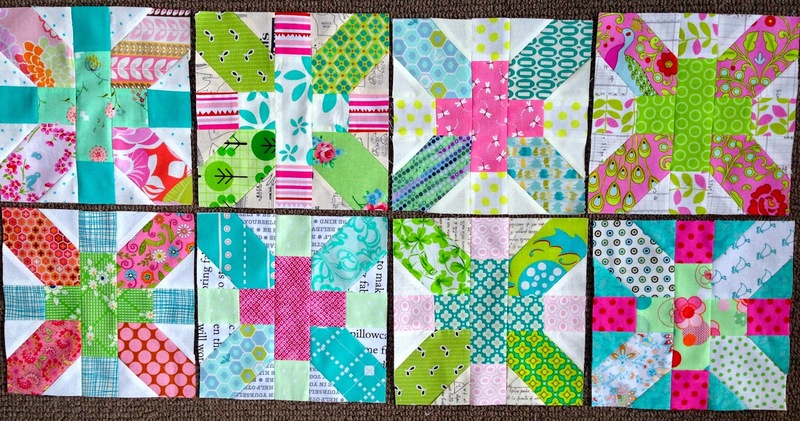 Thanks for such gorgeous blocks, Suz. You're the best!! I love seeing these blocks just keep on coming! Your quilts are going to be amazing. Love the colors and the prints in this group a lot. Wish I had some of those prints myself. Oh wow, this was such a pretty post to see. Love these delicious blocks and the last photo of the reds looks dreamy. Oh I just love the blues and pinks! A bright spot in an otherwise dreary day I'm having. such pretty blocks. I have so enjoyed this block exchange. I know I am going to love the last month's blocks - so many of my favourite warm colours. As usual, I love the blocks you two make together. It will be a terrific quilt when it's all finished. I'm still waiting on some from Krista (I'm thinking with her pregnancy that it was too much to get them sewn) and when they arrive, we're all done, too!